Samantha Southall, CPA was recently promoted to Director at Freed Maxick CPAs, P.C. Samantha joined Freed Maxick in 2004 after spending five years with a "Big Four" firm. 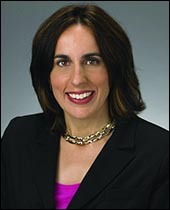 She was most recently a Senior Manager with the Firm's Batavia, NY Tax Practice. Samantha specializes in business and individual income tax and tax consulting, and counsels clients on tax strategies, planning, as well as compliance and audit issues. In addition, Samantha has significant experience with New York State credits and incentives such as the New York State Excelsior Jobs program. Samantha is also a significant participant in Freed Maxick's internal development program, designed to aid in the retention and advancement of all employees. "Samantha is a welcome addition to the Director group of Freed Maxick. Her energy and enthusiasm, coupled with excellent technical skills and the ability to serve her clients' needs, position her as a leader and mentor to our staff members. Samantha's presence and involvement in the community is also an asset to the Firm, and we appreciate her involvement with our Employee Advancement and Retention Network, "E.A.R.N." program, which will provide the opportunity for our staff to partake in activities that will lead to their professional development, growth and advancement. We are proud to name Samantha a Director and thankful for her continued years of service to the Firm," said Paul Battaglia, CPA, Managing Director of the Batavia office. Samantha is a member of the New York State Society of Certified Public Accountants, Vice President of the United Way of Genesee County, member of Batavia Rotary and Treasurer of the Batavia Rotary Memorial Foundation. She received her Bachelor of Science in Accounting from St. John Fisher College in Rochester, NY and is a 2009 graduate of Leadership Genesee. Freed Maxick CPAs, P.C. is one of the largest accounting and consulting firms in Western New York and a Top 100 largest CPA firm in the United States. Serving closely held businesses, SEC companies, governmental and not-for-profit clients across New York as well as nationally and internationally, Freed Maxick mobilizes high-performance professionals to guide client growth, compliance, security and innovation. Freed Maxick specializes in the healthcare, manufacturing, real estate, banking, agribusiness and private equity sectors, and has more than 280 professional and administrative personnel, and offices in Buffalo, Batavia, Rochester and Syracuse, New York.